Burrata is my new favorite cheese, hands down perfection on a slice of pizza. Have you ever tried burrata? Burrata is a fresh Italian buffalo milk cheese that is made with both mozzarella and cream. It comes in the shape of a softball, with an outer shell of solid mozzarella and the inside is fresh cream and curds similar to the texture of ricotta cheese. If you’re a cheese lover like me, your mouth is probably watering just thinking about it. It is the perfect cheese for a pizza lover’s dream. You might be wondering where the ‘sauce’ is. There’s no sauce needed with burrata cheese. It melts down perfectly into your ‘sauce’, so skip the jar white sauce and just embrace the burrata life! For the crust on this pizza, I used a naan flatbread like this Newbury Phillips – Naan Plain Organic . You should be able to find naan in your local market, even Wal-Mart carries naan flatbread. They usally come in 2-packs, so you’ll easily be able to create two individual-sized pizzas. I’ve tried so many different homemade pizza dough recipes and mixes and they just don’t turn out how I want them. They’re also usually a little more labor intensive, and I wanted a quick and easy pizza recipe. To assemble this pizza it’s super simple. Simply brush the crust with olive oil. Take the burrata cheese ball and begin to pull of small chunks, placing them sporadically across the naan crust. 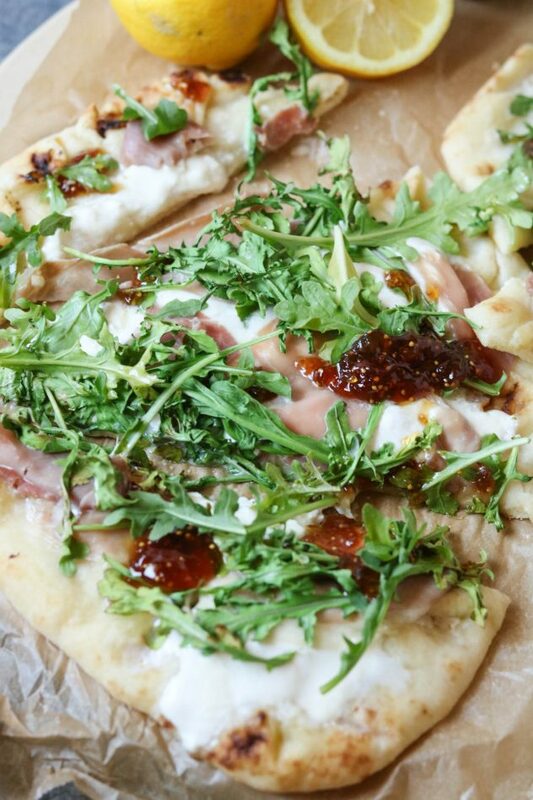 Then top with prosciutto and drizzle with fig jam. After you bake the pizza, top with fresh arugula and a dash of lemon juice. That’s it! Super simple and super delicious. Place the naan flatbreads onto a flat baking sheet. Brush the olive oil across both naan flatbreads. Season with sea salt and pepper. 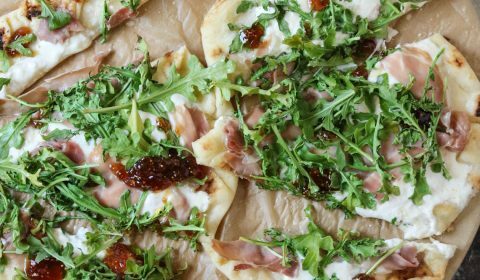 Take the ball of burrata cheese and start tearing off small sections, placing them sporadically across both crusts. 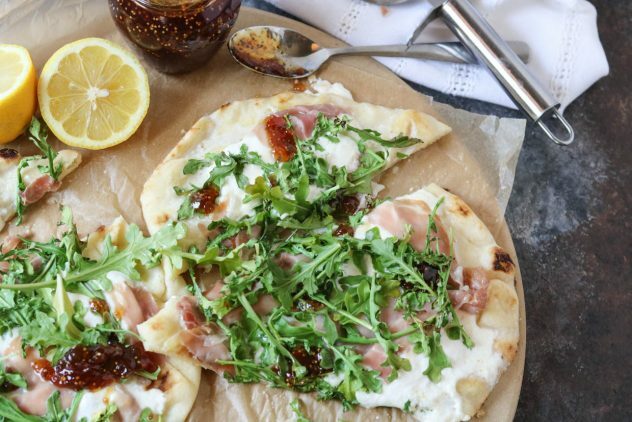 Lay the prosciutto slices across the burrata cheese, adding about 4 slices to each naan flatbread. Drizzle 1 tbsp. 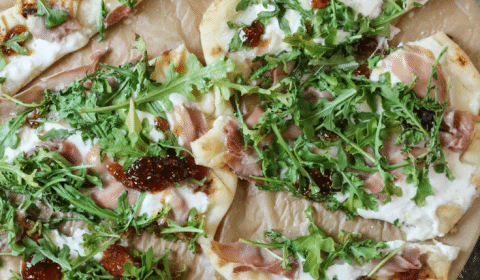 of the fig jam across each naan flatbread. Place the pizzas in the oven and bake for 6 minutes. Turn the oven to broil and broil for 1-2 minutes, watching closely. 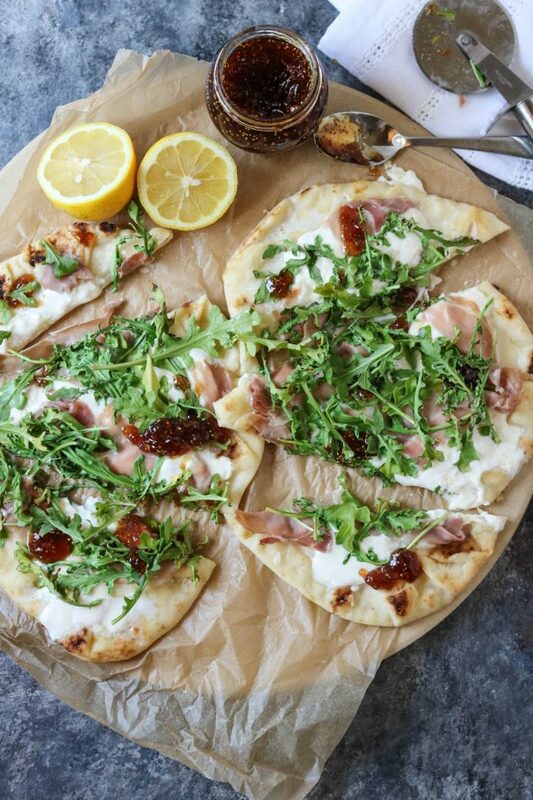 Remove from oven, top with fresh arugula and squeeze one half of a fresh lemon across each pizza. Serve immediately.